The American Heart Association recommends eating two 3.5 oz. servings of fatty fish, such as salmon, per week to ensure adequate intake of omega-3 fatty acids. Omega-3 fatty acids play a vital role in brain functions and may help to reduce the risk of chronic diseases, such as heart disease. Salmon, divided into two main classifications of Atlantic or Pacific, is one of the healthiest fish to eat. It serves as a good source of protein without a high saturated fat content. Salmon also provides essential minerals and vitamins, including vitamin B-12. Vitamin B-12, found only in animal food products -- including fish like salmon -- is essential for the formation of red blood cells. It also plays a role in proper nerve function and the production of DNA – the genetic material in cells. Vitamin B-12 activates the enzyme methionine synthase, which stimulates the conversion of homocysteine, an amino acid, into methionine, another amino acid. High levels of homocysteine in the blood are associated with an increased risk of heart disease, so vitamin B-12 can help to reduce the risk of heart disease. A vitamin B-12 deficiency affects 10 to 15 percent of adults over the age of 60 in the United States and usually occurs due to decreased absorption, according to the Linus Pauling Institute. A vitamin B-12 deficiency causes megablastic anemia, characterized by fatigue, constipation, weakness, loss of appetite and weight loss. To support these important body functions, the National Institute of Medicine recommends adults consume 2.4 mcg per day. To meet the recommended daily intake and avoid a deficiency, doctors encourage eating natural vitamin B-12 sources. 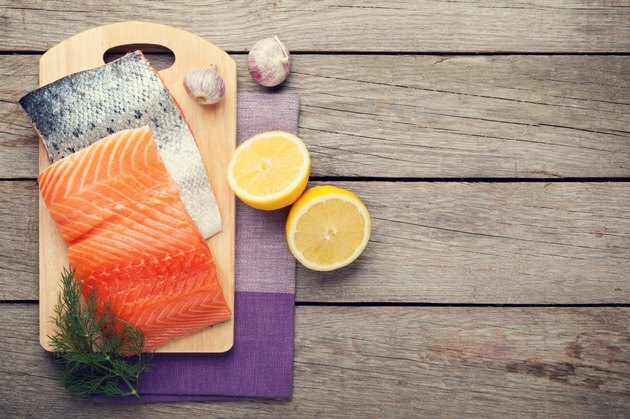 Salmon contains more vitamin B-12 per serving than beef, which many people consider a good source of vitamin B-12. A 3 oz. serving of cooked salmon contains 4.9 mcg, more than the recommended daily intake. If you seek to consume a low-fat heart-healthy diet, consider making salmon a part of your weekly meal plan. In addition to being an excellent source of vitamin B-12, a 3 oz. serving of salmon provides 17 g of protein, more than one-third of the recommended daily value. Salmon also serves as a good source of calcium, providing 19 percent to 24 percent of the recommended daily value. For those who suffer from lactose intolerance and cannot consume dairy products, eating salmon can help to reach calcium intake goals. Salmon does contain fat, but the majority of the fat is unsaturated fat, considered the healthy fat for its role in reducing low-density lipoprotein cholesterol levels.